Add Dashboards in the Syncfusion Dashboard Server. This section explains on how to add Dashboards in the Syncfusion Dashboard Server. 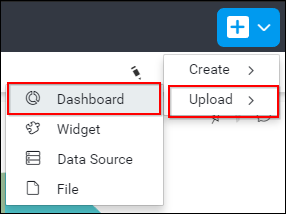 Click on the Upload button in the menu and select Dashboards to add a Dashboard. 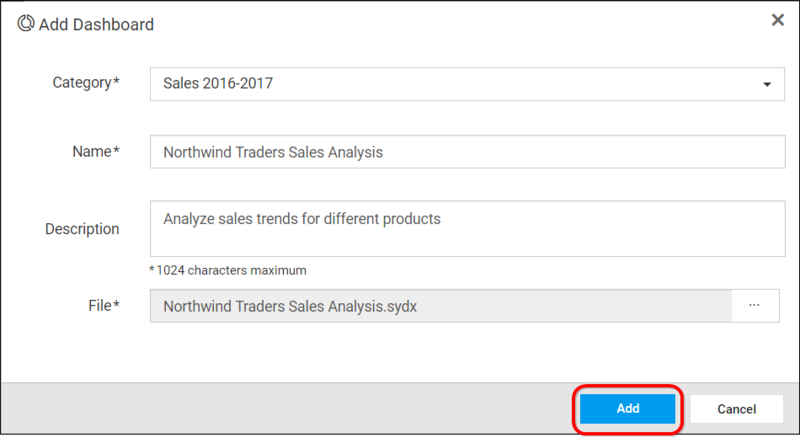 Select a category for the Dashboard and fill in the name and description of the Dashboard and upload the Dashboard file(.sydx) in the Add Dashboard dialog box. After filling the form, the Dashboard can be saved to be added in the Dashboard server. Read Write Delete Download permission for that Specific Dashboard will be added for the user who created the Dashboard.